The Doc, photo by by Lachie Goldsworthy. Thomas Surfboards video profile by Mick Soiza. Ever since shaper Thomas ‘Doc’ Bexon and glasser Jake ‘Cut Lap’ Bowrey joined forces, they’ve been working symbiotically in expressing style and inspiring new designs into the world of finely-crafted surfboards. 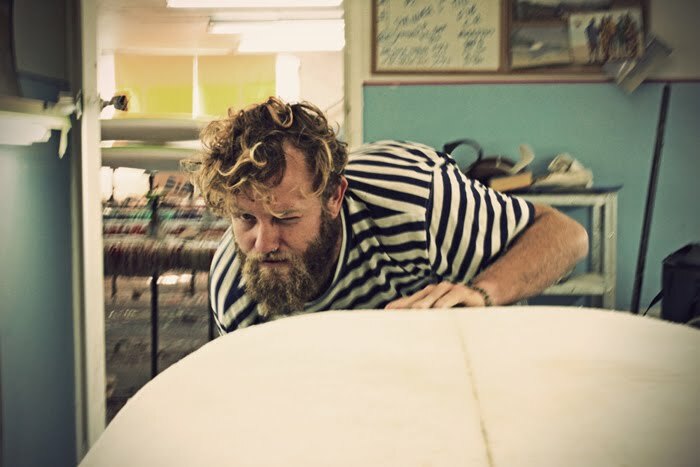 From their humble shaping bay in Noosa Heads, Thomas and Jake handcraft surfboards for the world’s best stylists Harrison Roach, Matt Cuddihy, Zye Norris and Indonesia’s Husni Ridhwan amongst many others. When asked where Thomas got his inspiration from, he's keen to anwser: “I started getting interested in making boards because there seemed to be no-one making the kind of boards that the guys who I loved to watch, like Joel Tudor, were riding. My biggest influences in terms of surfboard making have probably been a lot of the mid 60's old mals by guys like Hayden, McTavish and Keyo. A lot of the boards they were shaping had many great characteristics and they had the noseriding really wired. There was a pretty crazy progression in surfing history in that era”. Thomas is quick to continue: “over the last decade, I have kept refining what I am doing and I’m really happy with how my longboards perform now. I think after surfing them for so long and doing so many, I have worked out what really works when it comes to logging, stall-turns, trim and good old-fashioned noseriding. In many ways, it is not the size of the board that makes them work but the shape, particularly with regards to the rolled bottoms featured in my boards. I'm also shaping a fair number of twinnies, mini-simmons, performance quads, hulls and eggs that work really well too." By staying away from the norm, Thomas and Jake strive to keep themselves inspired. They continue to perfect their skills in the shaping bay and create truly unique boards for a diverse range of surfers.